There was something special about the woman at the restaurant. Thalia did not know what it was, other than that she was obviously terminally ill, but that wasn’t it. No, there was something more to it, but Thalia could not put her finger on it. When Mercy Wolfe followed her into the restaurant bathroom, Thalia had no idea her whole world was about to change. 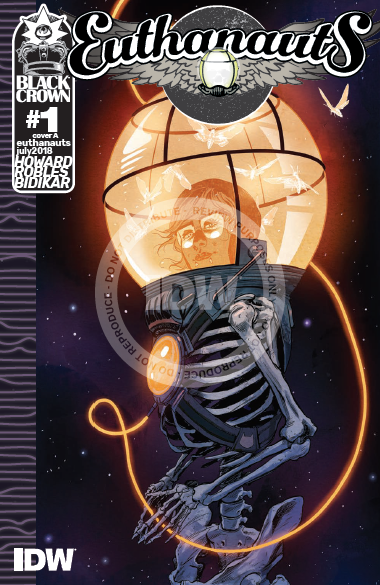 Black Crown’s inaugural issue of Euthanauts is a visual masterpiece right from the beginning. Nick Robles’s art is sharp and on point, delivering a tone of brilliant contrast from the start. The muted blues and greys are accentuated with brilliant pops of color that snap the eyes into focus wherever he wants to lead you, and it is worth letting him do so. The cover is intriguing and brilliant (the alternate cover by Mark Buckingham and Eva de la Cruz is equally incredible) and the art inside continues the trend. The writing of Tini Howard is solid and draws the reader in with a mix of dialogue and exposition proportioned out in good measure, feeding off one another as the story unfolds and the reader is pulled deeper in. I am excited about seeing where this story goes going forward and I cannot wait for the next issue. This is rated a five out of five for me. You can find more on this comic at IDW Publishing.